Since March I've been writing about the trends in social media use in higher ed, and I recently highlighted great idea #50. So, I decided what better way to celebrate reaching that milestone than put all those ideas together in one place! Below is Part 1 (click here for Part 2!) of a list of 50 awesome ways higher ed is utilizing social media to engage with prospective students, current students, alumni, and parents; promote important news and research; and help bring campus stories to a wider audience. If you enjoy this list and the ideas on it, please bookmark the blog, follow me on Twitter and Facebook, and use the form on the right to submit a great idea that I haven't featured yet! What happens when you ask your fans to take pictures of pets dressed up in school colors and share them on Instagram, Pinterest, and Facebook? Magic. Original post. Put some disposable cameras around campus + judicious use of a few hidden video cameras = an incredible viral video. Click here to see me completely rip this idea off for the University of Portland. Original post. Yes, I'm write about myself sometimes. So sue me! Wandering around and capturing campus fashion is a guaranteed way to get off-the-charts engagement. Original post. Doubtless the funniest video series starring a school chancellor ever. Original post. A brilliant example of building community by allowing a new person to take over the school's official Twitter account every week. Original post. A really fun list of reasons to love Marquette. Buzzfeed gets outrageous traffic for a reason, and colleges are perfect for listicles like this. Original post. Make managing a higher ed Instagram page much easier by sharing your followers' Instagram pics with a re-posting app. Original post. Four people spelling out "OHIO" with their bodies. (Or three people and the Eiffel Tower!) Easily the best example of massive participation with user-generated content in all of higher ed. Original post. Conducting a bracket-style contest between dorms is a great way to capture March Madness excitement even if you're team isn't in the tournament. Original post. Want African school kids to sing your fight song or soldiers across the world to show off their school pride? Leveraging sudents and alumni abroad is a great way to get engagement. Original post. Class photo in the shape of the school mascot!!! Original post. Show off the global impact of your school with an awesome map that shows the home countries of all your international students. Original post. Terrific video series that features a variety of people from the Carlson school of business in an informal, comfortable setting. Original post. UP (i.e. me) again! Instill pride and drive up engagement by making your community the centerpiece of your next marketing campaign. Original post. Great example of showing appreciate for your college's home town and connecting with the community. Original post. Using Facebook events and Twitter chats to connect with admitted students, one of the most excited - and important - constituencies for higher ed social media managers. Original post. Making research news interesting and engaging is one of the best ways to bring fresh eyes to your content. Original post. Everyone loves learning about the incoming freshman class, and a snazzy infographic is a great way to spread the word about the newest members of a school family. Original post. 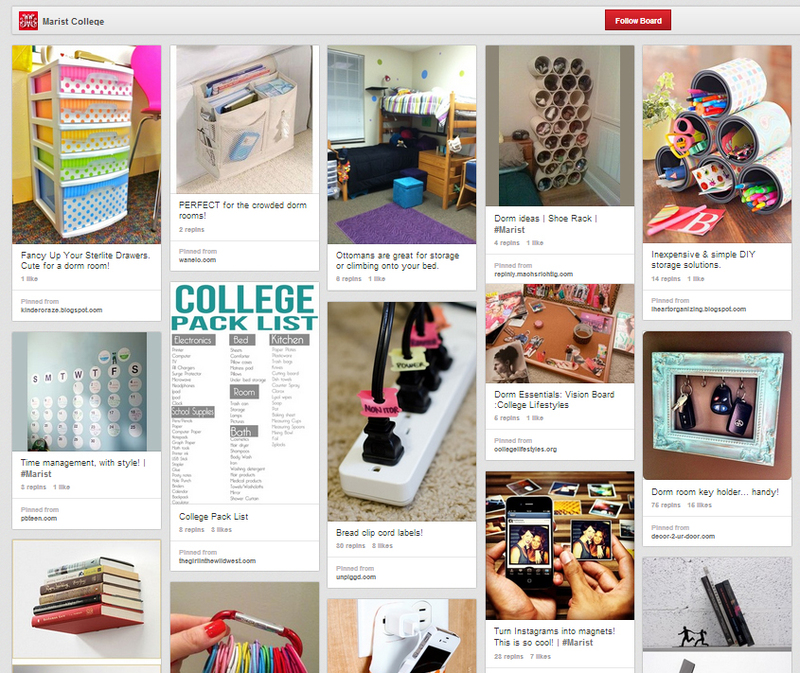 A brilliant use of Pinterest to give ideas and inspiration to students getting ready to move into the dorms. Original post. No matter how you do a graduation timelapse video, it's always really cool! Original post. Terrific use of behind-the-scenes access in a locker room after a big win! Original post. Crowd-sourcing at its finest, creating a campus Top 10 list. Original post. The perfect solution to the problem of finding content to post during the long, slow summer months. Original post. I can't help it... I write about myself a lot. But if you're thinking about launching an Instagram page or are trying take the one you have to the next level, this is a helpful step-by-step guide. Original post. Again, if you enjoyed this list and the ideas on it, please bookmark the blog, follow me on Twitter and Facebook, and use the form on the right to submit a great idea that I haven't featured yet!